Forward TS - is the "Forward T" product line enhancement for working with MPEG MPTS (Multi Program Transport Stream) in ASI and/or IP formats with the ability to insert commercials and overlay titles. The FD422 board supports data input and output in the ASI format. To input and output data in the IP format, the standard netcards are used (e.g., Ethernet 1Gbit). Transport stream input from a tuner to the computer via the ASI or IP interface. The demultiplexer divides the stream into separate TV channels (or programs, in other words). The video and audio from any of the TV channels can be decoded and come to the FDOnAir program input as "passthrough video", in which FDOnAir can insert blocks of commercials and/or overlay titles. The resultant video and audio are compressed again and come to the multiplexer input. Some TV channels can come from the demultiplexer output to the multiplexer input without any change (this feature is currently under construction). 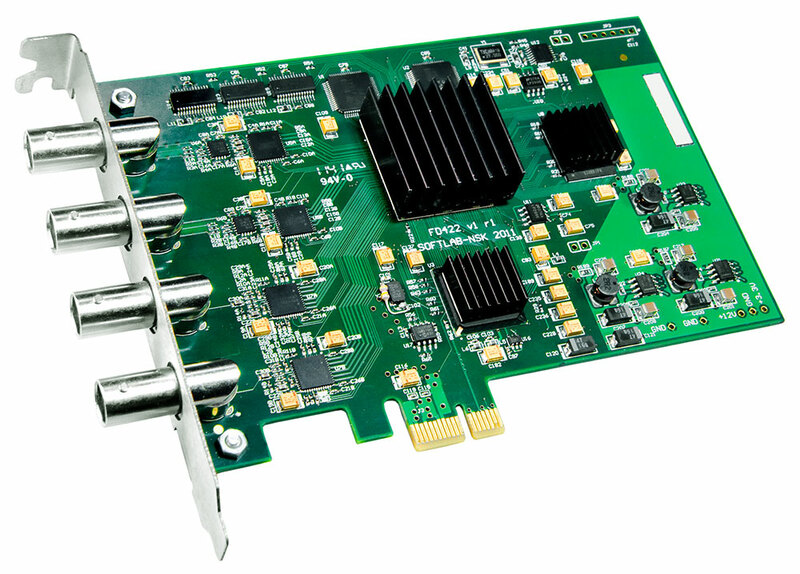 The Multiplexer joins all the TV channels into one transport stream, which is output via the ASI and/or IP interface. Two video compression formats are supported: MPEG2 and AVC (Advanced Video Coding or MPEG4 part 10, H.264). One server can process several TV channels. Several servers can be joined into a local network to process many TV channels transmitted in one transport stream, e.g., in one multiplex. Software supplied in the delivery set is designed to work with systems of different complexity. The SLStreamer Lite program uses ready templates to build standard solutions (streaming one's own information channel, inserting commercials in a TV channel, etc.). The user must only select an appropriate template and fine-tune the system specifying the compression parameters, IP addresses, etc. Compression parameters are clear even to an inexperienced user: it is sufficient to specify the output stream and find a compromise between the processor load and compression quality. When building complicated distributed systems incorporating several servers interacting with each other, a program with a more complex user interface is used - SLStreamer Pro. The interface supports configuring separate graphs, their starting and stopping procedure, controlling each graph operation, saving and restoring their state. A once configured system operates in the automatic mode, e.g., after restarting the computer, the system automatically starts the graphs which are to be executed currently. Setting the program and controlling the system status can be performed remotely. To work with the broadcast schedule, insert commercials, and overlay titles, the FDOnAir program is used. The operator works with it in much the same way as in the Forward TA system based on FD322/FD422/FD842 I/O board. inserting a digital signal from ASI to IP and vice versa. This product is delivered as a turnkey solution (a computer unit with the pre-installed and configured system). If necessary to update the software to a newer version, you can get it in the "Download" Section. To download documents, go to the "Documentation" Section. Note: Currently, the software package and documentation for the "Forward TS" product are being prepared for publication. For more specific information, please contact Support.